Museo Reina Sofía presents next Setember the exhibition Specters of Artaud. Language and the Arts in the 1950s, the first exhibition to situate dissident surrealist Antonin Artaud’s production—in theater, cinema, drawing, and for radio—as a crucial legacy for understanding artistic practices at midcentury. By including varied means of artistic expression, the exhibition looks at how Artaud’s desire to move beyond the confines of language, understood as both writing and speech, lives on in the work of artists similarly concerned with questions of language, the body, and spectator participation. To date, Artaud’s importance for the arts has been largely overlooked owing to the centrality of neo-Dada in the exhibition and historiography of postwar art. Composed by some three hundred works, the present exhibition thus hopes to shed new light both on Artaud and on his multifaceted reception in the postwar moment. The visual artists, poets, writers, and composers in Specters of Artaud are drawn from three primary contexts: France, the United States, and Brazil. As a result, the exhibition proposes no “School of Artaud.” Rather the exhibition charts his work’s appropriation, recontextualization, and translation, all of which form part of a broader intellectual history and series of transatlantic exchanges. Specters of Artaud is organized according to thematic sections that explore concerns central to Artaud’s life and his legacy: from the reinvention of language to his critique of the psychiatric institution. In Specters of Artaud. Language and the Arts in the 1950s takes into view a different way of understanding the legacy of the historical avant-garde movements in the years that followed the end of World War II, and of articulating the way Artaud’s production is adopted, and occasionally misinterpreted, thus generating a mixed landscape of sound and image in which his postulates remain mightily present. 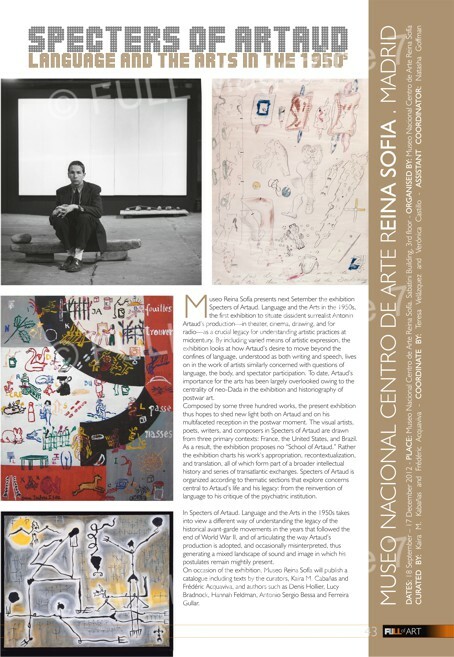 On occasion of the exhibition, Museo Reina Sofía will publish a catalogue including texts by the curators, Kaira M. Cabañas and Frédéric Acquaviva, and authors such as Denis Hollier, Lucy Bradnock, Hannah Feldman, Antonio Sergio Bessa and Ferreira Gullar.